In Ceuta there are security forces everywhere. The national police guards the city, while the civil guard controls the border district and the fence. The agents of the European Union Agency FRONTEX are responsible for the surveillance of the sea. In Ceuta FRONTEX agents help out with special duties, like special police operations during the local fair. Every summer the feria takes place in Ceuta, a local fair with music and decorations throughout the city. While the people of Ceuta celebrate in flamenco dresses and enjoy a festive spirit, the feria is also a highlight for the immigrants. The attractions and rides that were brought to Ceuta from mainland Spain have to be shipped back after the festival. You cannot find more trucks leaving Ceuta by boat than on the night after the fair. And as an immigrant, you don’t have many other chances to hide under a truck to get out of Ceuta. Of course, this is no longer a secret for Spanish police. Each truck that leaves the port of Ceuta after the fair is examined by police dogs and mirrors looking under the machines. 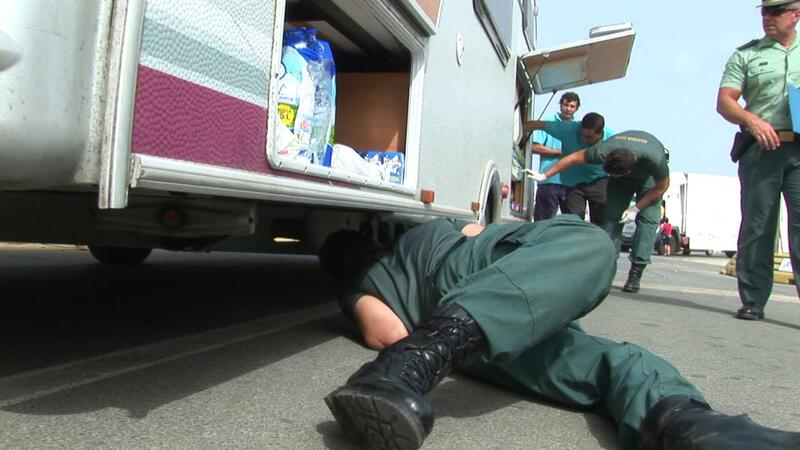 FRONTEX uses special devices to detect the heartbeat of humans inside the trucks. The message is easily understandable: it won’t be easy to fool the guards of “Fortress Europe”. Nevertheless, some make it across each year, hidden underneath these trucks.